An actor performs for her guests at the Grand Meadow Heritage Center's annual haunted house near Marcus, Iowa on Saturday, Oct. 21, 2017. 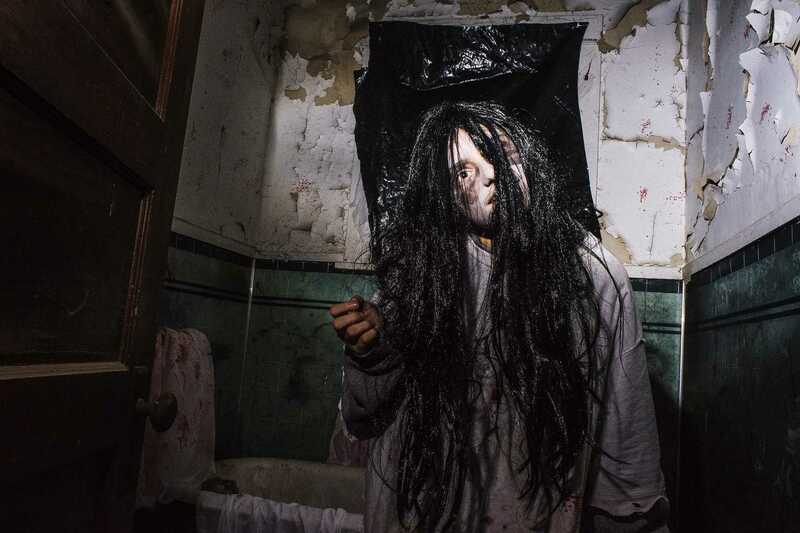 To some, haunted houses are a family fun Halloween activity. To others, they are too scary to enjoy. Nothing is better than that feeling you get right before you walk into a haunted house — heart racing, blood pumping, fists clenching. It’s a feeling I live for. Yes, haunted houses are scary. At every turn, there could be a ghost or ghoul waiting to jump out, and that’s the point. Haunted houses are captivating. They force every participant to pay attention and live in the moment — something that so many of us need to do a lot more of. More than their unparalleled spooks and scares, haunted houses serve as fundraisers for local charities, nonprofits, and municipalities. In the Johnson County area, Jaycees hosts a haunted corn maze. Last year, profits were donated to an Easter egg hunt and the Children’s Hospital among other charitable causes. Community members are also encouraged to bring canned goods for donations. Haunted houses also serve as a nonalcoholic entertainment for college students and people looking to have alcohol-free fun. Most of all, haunted houses bring people together. Whether it’s with a group of close friends or family members, dredging through a haunted corn maze or haunted house, everyone forms a bond. Haunted houses provide family friendly fun that benefits the community as a whole. Why not give it a try? I’ve feigned interest in going to haunted houses before, but I’ve never actually followed through on an invitation. I enjoy horror movies because they can be consumed while sitting down. In truth, I’ve always just been lazy in this respect — the physical exertion of attending a haunted house is spookier than anything else. However, I recently found a “perk” of having a newly diagnosed medical condition involving an excessively high heart rate: I probably shouldn’t go to a haunted house anyway. In 2016, a “Today” show correspondent had his heart rate monitored as he went through New York City’s Blood Manor. The scares took his heart rate up to 146 beats per minute. My usual resting heart rate is already somewhere around there, so I’d probably pass out at a haunted house (or so I will say as my excuse). Medical concerns aside, people should also be comforted in knowing that haunted houses are pretty safe. Professional ones are standardized to meet city and state codes, equipped with sprinklers and emergency exits. Outside props, including knives and swords, are not allowed for guests and often actors as well. That’s not to say injuries don’t happen. This month, a man in Tennessee was stabbed in the arm at a haunted house and needed nine stitches. Really, though, haunted houses are fun for people who like them. Barring certain medical conditions, you’ll almost certainly be fine. If you’re worried about the safety of haunted houses, just know that you’re much more likely to injure yourself while carving a pumpkin.